The Boxing Truth®: Marquez vs. Alvarado: Should The Winner Face Pacquiao? Marquez vs. Alvarado: Should The Winner Face Pacquiao? When Juan Manuel Marquez entered the ring last October to challenge Timothy Bradley for the WBO world Welterweight championship he was clearly at a career-high having scored a thrilling one punch knockout over his archrival Manny Pacquiao in their epic fourth encounter. Bradley however, would earn a hard-fought split decision over Marquez to retain his title in a fight where a legitimate argument could be made for either fighter being the victor. In many ways Marquez’ loss to Bradley was not all that unlike some of Marquez’ previous setbacks, most notably against Manny Pacquiao in three of their four fights. Closely fought battles where neither fighter is able to stand out clearly from the other. It is certainly understandable how losing close decisions can leave a bad taste in the mouth of a fighter. Readers will recall that I scored the Bradley-Marquez fight a draw. I did however, state after the fight that Marquez was clearly not disgraced in the fight with Bradley and that the loss would not seem to hurt Marquez in terms of marquee value or the ability to secure big money fights. Marquez has had an illustrious career and one loss does not diminish his standing in the sport. Marquez, now looking to rebound from his loss to Bradley will take on former WBO Jr. Welterweight world champion Mike Alvarado on Saturday night at the Forum in Inglewood, California. Much like Marquez, Alvarado is looking to bounce back from defeat. In his last fight, Alvarado was stopped by top Jr. Welterweight contender Ruslan Provodnikov in ten rounds, losing his WBO title. This fight has the ingredients to be exciting on paper. Both fighters have Boxing skills, but both have also shown a willingness throughout their careers to go toe to toe with their opponents. 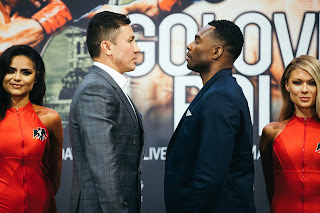 Although the thirty-three year old Alvarado is the younger man by seven years in this fight, questions regarding whether he has recovered from the loss to Provodnikov might be valid. It is important to remember that Alvarado is not just coming back from a loss in his last fight, but his previous three fights. His bout with Provodnikov and his two bouts with Brandon Rios were all grueling battles. One does have to wonder what those fights took out of Alvarado. He has however, always shown a warrior’s heart and I have no doubt that Alvarado will give everything he has in this fight. Juan Manuel Marquez also is no stranger to grueling battles. Although Marquez may appear to have an advantage in this fight in the eyes of some, it is also important to remember that Marquez is forty years old and even though he might appear to have an advantage, one does have to wonder when the accumulative effect of all those battles that Marquez has had over the years will begin to take a visible toll. This fight could go several different ways. It is logical to assume that Marquez a precision counter puncher will look to allow Alvarado to bring the fight to him and look to set traps and capitalize on any mistakes that Alvarado might make. Marquez however, must also be careful. In his last fight, although seeming to match Timothy Bradley punch for punch, Bradley was the busier of the two and some might say that Bradley’s busier activity was enough to win some very close rounds that eventually resulted in him winning the fight. It will be interesting to see if Marquez is more active in this fight while playing the role of counter puncher. It is also logical to assume that Mike Alvarado will look to bring the fight to Marquez from the outset and look to impose his will on him. Although both fighters can box, it would not surprise me to see this fight turn into a war at some point. The question that I have coming into this fight is whether or not Alvarado’s previous three battles have had any effect on him. If Alvarado shows no ill effects from those three encounters and can nullify Marquez’ offensive output, this fight might end up in his favor. If Alvarado however, cannot avoid Marquez’ counter punches and cannot limit Marquez offense, Marquez could have the advantage. Although Alvarado is the naturally bigger man in this fight, it will be interesting to see whether he is the stronger of the two fighters and whether or not that could play a role in the outcome. Whether or not this fight turns into a toe to toe battle or a tactical Boxing match remains to be seen. The fight, which has been billed as a WBO eliminator in it’s Welterweight ratings would indicate that the winner of this fight would be next in line to challenge WBO champion Manny Pacquiao, who recently regained his title in April. Some readers might remember that I stated last October prior to Marquez’ fight with Timothy Bradley that, that fight might have been the start of an unofficial round robin tournament of sorts involving Marquez, Bradley, Alvarado, Brandon Rios, Ruslan Provodnikov, and Manny Pacquiao. So far, this unofficial round robin concept has begun to play out with Alvarado facing Provodnikov and Pacquiao facing both Rios and Bradley in his last two fights. Marquez and Alvarado will now face each other in a continuation of this unofficial scenario. Should the winner of this fight be next for Pacquiao? I am sure that Boxing fans and experts alike would welcome a fifth encounter between Pacquiao and Marquez and would also welcome the potential of Alvarado facing Pacquiao. Before either can face Pacquiao however, they must face each other. The end result could be a great fight.